To maintain mutualism, plants specifically appeal to their animal partners' perception. This study show that Paleotropical carnivorous plants have reflective structures that are acoustically attractive for mutualistic bats. This phenomenon can similarly be found in a few Neotropical bat-pollinated flowers. Credit: Schöner et al./Current Biolgoy 2015. Additional images courtesy of C.C. Lee and M.D. Tuttle. In Borneo, some insectivorous bats have developed a rather intriguing relationship with carnivorous pitcher plants. The plants offer the bats a relatively cool place to roost, free of parasites and competition from other bats. In return, the bats keep the plants well fertilized with their droppings. Now, researchers reporting in the Cell Press journal Current Biology on July 9 show that the plants rely on special structures to reflect the bats' ultrasonic calls back to them. That adaptation of the plants makes it easier for bats to find their plant partners in the cluttered forest. "With these structures, the plants are able to acoustically stand out from their environments so that bats can easily find them," says Michael Schöner of Ernst-Moritz-Arndt-University of Greifswald in Germany. "Moreover, the bats are clearly able to distinguish their plant partner from other plants that are similar in shape but lack the conspicuous reflector." It all started when study author Ulmar Grafe of the University Brunei Darussalam discovered bats roosting inside pitcher plants. He, along with Michael and Caroline Schöner and Gerald Kerth, senior author of the new study, first explored what the plants and their bat partners were each getting out of the deal. Their findings—that the plants offer bats a place to roost in return for nitrogen—helped to explain something that had vexed pitcher plant researchers: those plants, Nepenthes hemsleyana, are rather bad at attracting insects, compared to their carnivorous relatives. 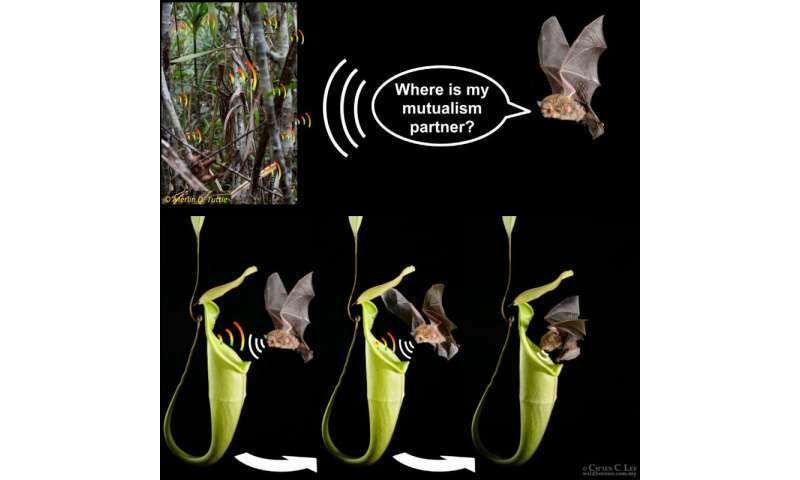 In the new study, the researchers wondered how N. hemsleyana and the bats, Kerivoula hardwickii, find each other. After all, both species are relatively rare, and they live in a rather crowded place. That led the researchers to an idea: "Wouldn't it be neat if pitchers somehow advertised their presence to the bats?" In fact, some neotropical flowers have a similar problem: they depend on nectar-feeding bats to pollinate them. Some of those plants have dish-shaped petals or leaves to reflect echoes of strong intensity when, for instance, a bat is calling towards them. Those reflectors allow the plants to stand out from their surroundings so that the bats can easily find them. It now appears that the unrelated pitcher plant N. hemsleyana does the same thing, but for a different reason. The researchers recruited Ralph Simon from the University of Erlangen-Nuremberg to their team. Simon had been studying the acoustic adaptations of bat-pollinated flowers for some time. In Borneo, Simon and his colleagues used an artificial biomimetic bat head that emits and records ultrasounds to test the pitchers' acoustic reflectivity from different positions and angles. Those studies uncovered a strong echo reflection from the pitchers' back walls, where the plant form works perfectly as an effective reflector. Behavioral experiments showed that the bats respond to those sounds echoed back to them from the plants. Bats were better at finding partially hidden pitcher plants when their reflectors were intact than when the reflector had been reduced. The bats also chose pitcher plants more often as the best places to roost when the reflector had not been reduced. The study is yet another fascinating example of how nature and evolution solve problems, the researchers say. "Carnivorous plants in general have already solved the problem of nutrient deficiency in a very unusual way by reversing the 'normal system' of animals feeding on plants," Schöner says. "It is even more astonishing that in the case of N. hemsleyana the system is taking a new turn. While N. hemsleyana reduced many insect-attracting traits, it obviously exhibits some traits that are highly attractive for a species that provides the plants with nutrients without being digested by the plant itself."